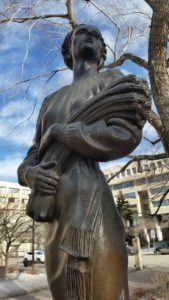 Madonna of the Wheat commemorates the often-unmentioned role of pioneer women in Canada. To supplement the family income, men left the homestead to help build the Canadian Pacific Railroad. They left the women alone for months tending farms and caring for the children. This difficult, unforgiving work lay an important foundation for the prairie provinces. This sculpture was presented by the Ukrainian Women’s Association of Canada (Alberta Branch) as part of Alberta’s 75th anniversary. It acts as a symbol for the Ukrainian community. Biography: John Barney Weaver was born in Anaconda, Minnesota on March 28, 1920. Trained in fine art from an early age by his painter/sculptor/teacher father, Weaver later studied under Emil Zettler and Albin Polasik at the Art Institute of Chicago. Following his graduation, he taught sculpture and figure drawing at the Layton School of Art (Milwaukee) and curated for the Smithsonian Institute as a Natural History Sculptor. Weaver moved to Edmonton in 1966 and sculpted numerous pieces for the 1967 opening of Alberta’s Provincial Museum. Thanks to his employment as a sculptor at both the Smithsonian Institute in Washington and the Alberta Provincial Museum, John Weaver’s bronzes fill North American museums, galleries, and private and public institutions. His most famous works include life-sized bronzes of Robert Burns, Jacqueline Kennedy, Harry Truman, Charles Russell, and Mrs. Lyndon B. Johnson among others. Weaver eventually became a Canadian citizen. He settled in Silver Creek, B.C. where he continued to create bronze sculptures until he passed away in 2012.